WASHINGTON — Out of line. Outrageous. Usurious. Highway robbery. That’s what Northern Virginia commuters are saying about the new tolls on Interstate 66. As commuters return from holiday vacations, the region’s traffic will ramp up to normal congestion levels. And the new rush-hour tolls and longer hours for HOV restrictions on I-66 enter a new phase after an initial rollout during lighter December traffic conditions. According to an online, unscientific WTOP survey of 1,030 I-66 commuters, drivers have not seen much benefit from the tolls. But regular HOV and bus commuters say they enjoy the faster, smoother trip inside the Capital Beltway. WTOP’s survey was conducted from Dec. 14 to 18. See the results here. The tolls began Dec. 4 for solo drivers who want to use the lanes from 5:30 to 9:30 a.m. and from 3 p.m. to 7 p.m. The maximum toll charged in the first week climbed over $40 twice, leading to calls to cap the tolls or reduce the window when the tolls are applied. State officials have said the tolls are moving traffic faster and will ultimately move more people along the corridor thanks to the toll revenue, which is slated to pay for new express buses and make it easier to carpool. More than half of respondents told WTOP that their commute was worse or significantly worse than before the tolls began. About a quarter said the changes have eased their commute, according to the results of the internet survey taken during the second full week of tolling. Roughly a quarter of commuters said they were leaving earlier or hitting the road later to avoid the tolls. A slight majority said they were rethinking their commute after a week of tolls and extended rush-hour restrictions. 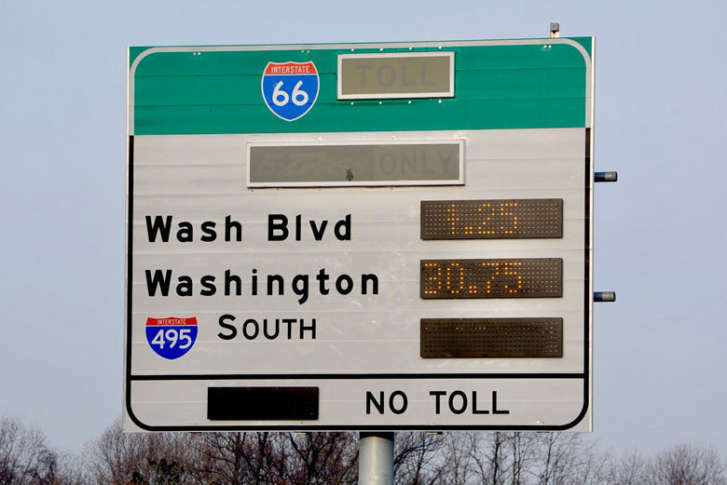 Driving another route was the most popular alternative to paying tolls on I-66 — far outnumbering options such as leaving earlier or later, carpooling, Metro and riding a commuter bus, respectively. Searching for a new job and moving were two other popular responses. Drivers complained about the high cost of the tolls, the lack of forewarning about what those tolls would cost at key jumping-off points such as the Vienna Metro station, and the extra hour that the restrictions are in effect. Commuters said they aren’t changing their habits, despite the goal of state officials to encourage more carpooling. Instead, they said they are sticking with their cars. And even as they consider changes to their commute, most said they would either leave earlier or later or take a different route to avoid the I-66 corridor. Public transit and carpooling were the least popular alternatives. Despite the response from commuters, Virginia officials aren’t ready to make changes to the tolling. “Right now, we are seeing positive results, but we need to continue monitoring the situation,” said Nick Donohue, deputy secretary of transportation for Virginia. During the initial four weeks, VDOT reported faster travel times along the interstate during the rush hour and outside of the rush hour, compared to travel times last December. The entire trip from the Beltway to the Teddy Roosevelt Bridge should take about 10 minutes, he said. In comparison, the same trip at 6 a.m. before the tolls would take about 25 minutes, Donohue said. Travel times along alternate routes were improved or unchanged — that includes the George Washington Memorial Parkway, Route 7, U.S. 29 and U.S. 50, compared to travel times in December 2016, Donohue said. That means for commuters who choose not to carpool or take public transit, there are still viable alternatives to get through the corridor without paying a toll, he said. “We’re hopeful that this project can start to move more people through this corridor,” Donohue said. New express bus service, park-and-ride lots, and eventually slugging and two more eastbound lanes will help achieve that goal, Donohue said. Virginia Gov. Terry McAuliffe and Transportation Secretary Aubrey Layne have rebuffed calls from state and local lawmakers to cap the tolls and reduce the hours — both have said the changes are working as designed. Donohue said that VDOT plans to keep tabs on the toll rates plus travel speeds on both the interstate and parallel routes to make sure the system is working. Roughly a third of the I-66 commuters surveyed said they carpool to work — of those, the vast majority said they were HOV commuters before the tolls. These commuters overwhelmingly said the changes have improved their trip to and from work. “Psychologically, probably it’s the bigger benefit and that predictability — having an expectation when I can get in to work is a significant benefit to me,” said HOV commuter Mitch Turner of Hamilton. He said the changes have shaved about 15 minutes off his ride to work in Arlington. “I love the new toll system,” wrote commuter bus rider Tim Martin of Reston. He said the changes have cut 10 minutes off his trip to Rosslyn. Still, he sympathizes with those paying the pricey tolls. “The tolls are a little bit outrageous,” he said. Ben Nakhavanit rides his motorcycle, for free, on the lanes from Tysons Corner to Arlington. He welcomed the tolls because HOV violators clogged the road previously. Now, the traffic flows freely, he said. “It’s much faster now, the way it should be,” Nakhavanit said. WTOP’s survey didn’t specifically ask about the change in hours — four hours of HOV restrictions in the morning and afternoon, instead of the previous three hours. But in the open comments section, commuter after commuter decried the change in hours and wrote that it has forced previously legal users of the interstate onto parallel routes. Others said they opted to leave earlier in the morning or later at night to avoid the tolls. Both Dan Fritzke and Kristen Koines previously were able to legally use the lanes at 9 a.m. under the old HOV restrictions. But the expanded hours has forced them both to find alternate routes to work. “If they had left the times the same, I think less people would be affected,” Fritzke wrote in his survey comments. Fritzke, a sales representative from Clifton, spends much of his day in the car for his job. He’s opted for the George Washington Memorial Parkway and U.S. 50 instead of paying the tolls on I-66 to reach Downtown. The workarounds can add as much as 50 minutes to the trip in the morning. Koines, of Oakton, previously hit the lanes after 9 a.m. to reach her office near Farragut West. The trip took less than 15 minutes. Now, she is facing an earlier departure time at the height of the morning rush hour to take an alternate route into the city. Donohue, the deputy transportation secretary, said the earlier start times were necessary to keep the road clear for HOV commuters. Previously, single drivers would jam the road trying to beat the start of the HOV restrictions, he said.